It's time again for Vintage Thingie Thursday! 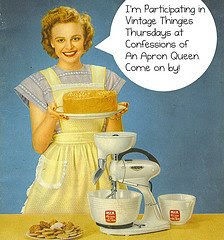 Head on over to Confessions of an Apron Queen and sign up to participate. If you like vintage stuff, you will find a whole plethora of amazing websites that are participating with great stuff. This week I want to share a pewter Christmas plate that my mother, Rita gave me. It is stain glass with over 200 different colors. The photos don't do it justice. If I use the flash it looks like thin plastic. If I don't the colors aren't very brilliant. In person the colors are very rich. Now, this isn't vintage in the sense of being antique. 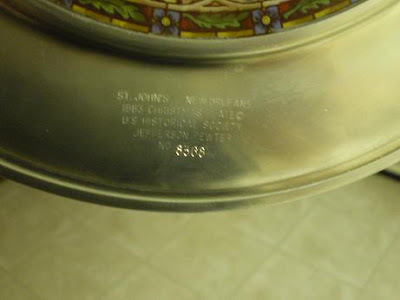 It's the United States Historical Societies 1983 Christmas Plate replica from St. John's Cathedral, New Orleans, Louisiana. The border is very detailed, and it's numbered. So, if you really, really want to see it in it's glory, you have to come here to the compound. I'll not only feed you, I'll let you use my noodle in the pool. Yes I will. "Jerry, please answer when I knock on the bathroom door." J: "You barely knocked, and I was getting ready to answer you when you opened the door." R: laughing, "You guys wanna know what Jerry looks like when he pee's?" D: "No, Renny, please, no." J: "Renny, your full of s**t."
I'm sorry. Did you say canoodling in the pool? Is that what they do on Big Brother? What are you doing up so late? Leaving comments on blogs like me? The dog just gave me the eye so I think I need to put her on the bed but I wanted to see what you were sharing for VTT first. I would come over and see the plate if I could. I bet it's really pretty in person. P.S. Every time I see that picture of Brian with the X and "Evicted" across his face, I crack up. And, I don't even watch the show. Lovely plate. 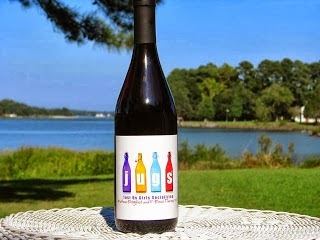 I am sure the colors are wonderful in person. Very beautiful plate. I know how hard it is to photograph things like that! I think you have to have a special lense or something. This is my favorite vintage thingie you've put up so far, and the fact that it's from Rita makes it even more special. I think it's gorgeous. Please sign me up for the Grandma J. Getaway, complete with water aerobics. I'd like to sign up for my excursions in advance. Of course water aerobics, but I also want to take the field trip to see the guy who helps you with your technical stuff. He has to be a genius. Please let me know when I have to send my money in. I'm working on travel arrangements now. Will I need a rental car or can I hope on the Compound Shuttle? Very nice plate. Do you leave it out all year? That is beautiful. I would love to come see it in person, and I will bring MY own noodle. I have oodles of noodles too. Love them. I am DEFINITELY coming on the trip to the compound! I am glad you are sharing noodles because I think it would be very cumbersome to travel with one on the plane. The plate is very beautiful. 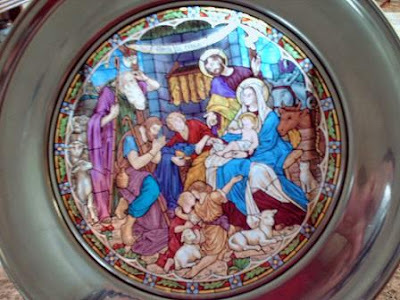 Beautiful plate - I love stained glass! Lovely plate. I am afraid I would break it if I touched it. Can I still come to the compound anyway? Your plates are beautiful!!! They are always more beautiful in person!!! 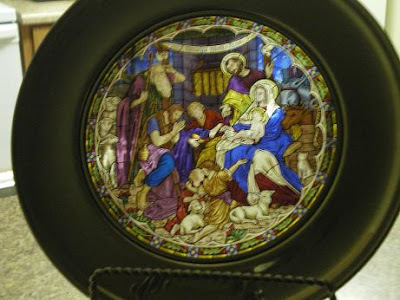 This is a beautiful nativity plate. I've seen them offered years ago, but couldn't get it them for my nativity collection. 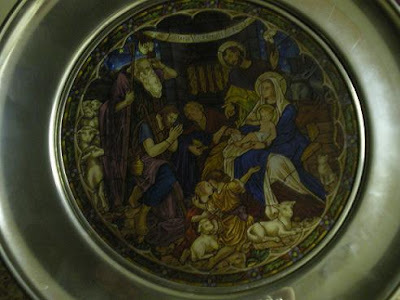 I have lots of sets of nativity plates but none from this series. That plate is beautiful! Thanks for sharing. Grandma J, I'd have that gorgeous plate out on display all year long. I love it. OMG...that plate is stunning...the colors! That piece is a keeper! I'm surprised at how many of you want to come to the compound! The door is always open, and the noodles are in the hall closet. Transportation is provided as well. What an unusual pewter piece. I've never seen one like it. It's a work of art. Love the stain glass in the plate. I'm sure the color is beautiful when held up to a window! Spectacular colors when held up to the light! I love pewter, too. Beautiful plate--I've seen others like it-the colors are brilliant! Even more special since your mother gave it to you! Makes a lovey keepsake and will only become more collectable. Nick, with Paul and Harvey, unless they protest. Woot! Woot! I'm so glad Dan got HOH. WHen's the season finale? Are you gonna be in Alaska during it? The top picture of the plate looks great. Love it! I love stain glass....that is just beautiful! !